The view from the top of Corkscrew Pass looking west. 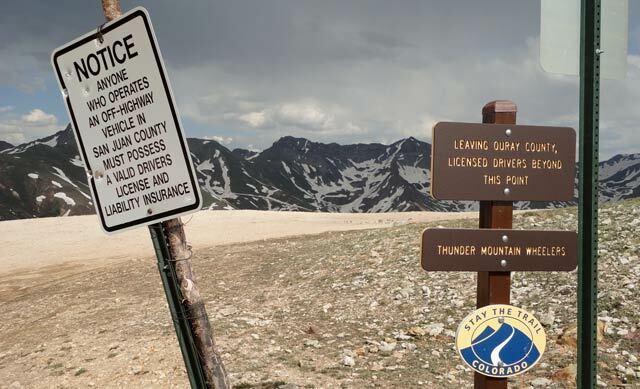 This is the boundary between Ouray and San Juan Counties. 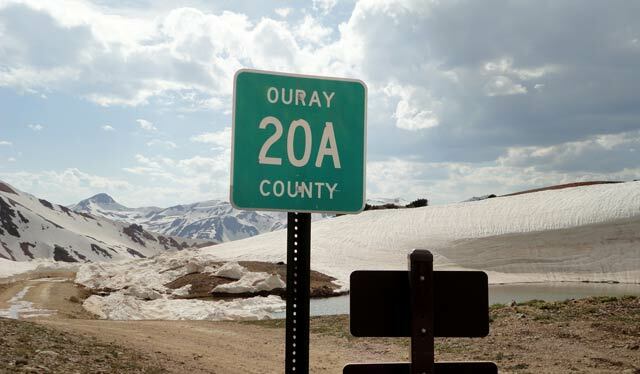 To the west is Ouray CR 20A, which takes you down to US Hwy 550. As noted in an earlier post, Corkscrew Pass is now open between US Hwy 550 and San Juan CR 10. I traveled it yesterday late afternoon on my Yamaha dirt bike. I must say it was a bigger challenge than it normally is because of the enormous snow load and swollen streams. GPS map of Corkscrew Gulch showing route to Corkscrew Pass. See text. Note at the very top that the base map alignment of US Hwy 550 is a bit off—it shows the road somewhat further west than it really is. My GPS track shows where I turned left onto CR 20. Follow the signs for Corkscrew Pass, which is Ouray CR 20A (there are other things to explore from this point—I left them for another day). At this point you need to either be on a competent dirt bike motorcycle, a sturdy ATV, or in a Jeep or some other 4WD short wheelbase vehicle. From the intersection between CR 20, 20A, 20B, and so on, the road up to Corkscrew Pass immediately becomes very steep (and will stay that way). And right now there’s lots of water crossing the road, which makes for a fair amount of mud. Mud reduces your traction, so plan accordingly. The road crosses the side of the mountain and then heads up Corkscrew Gulch, again steep, winding, bumpy, and rocky. There’s more scree than I remember. And you must ford several creeks. One was rather deeper than I thought and I ended up with a boot full of water, though I stayed upright and made it through. Where it says “there be dragons,” there is a creek in a rocky area that’s normally no problem to ford. Well, it was a problem yesterday. The creekbed and the road are one and the same thing for about fifty feet. I sucked in a breath, stood up, looked at a point on the far side of the creek, put it in first gear, and crossed. I did fine. But I made a mistake. I was so concerned about the creek that as I approached shore I didn’t pick another concentration point further up the road, so as soon as I gained the shore I fell against the embankment. I had no problem righting the bike and continuing on my way. I would say that crossing this creek is probably not much of a problem for an ATV or a Jeep, but for a motorcycle that’s 50 feet of not knowing what’s beneath you. From here you go up a reasonable slope following the bottom of the gulch. Then you approach the very steep switchbacks that take you to the top. Be of stout heart and keep going! In the past I’ve been forced to stop at switchbacks on this incline because of vehicles going down, and it’s a bear to get yourself pointed right and moving forward. In fact, yesterday the road was looser than I remember (and with more scree) and a number of times I felt my rear wheel (the drive wheel) spinning beneath me as it struggled for traction (yes, I have good tires). As I got to the top, I found more and more snow by the side of the road. The lead picture to this prior post shows what I found last evening—high snow banks! The pass itself, about fifty yards further on, is open and dry and a great place to take photos, which I’ve done and put in posts last year (do a website search—upper right hand corner of this page—for Corkscrew Pass and you’ll find several posts). Normally this is a straightforward road, but right now it has several “water features” and is not yet firmly packed. July 4th is right around the corner, so we’ll have lots of tourist traffic that will pack the road more tightly, making it much easier. I will admit that the views as you start up the final switchbacks are pretty spectacular. I suggest that if you want to pause to take photos, don’t stop on a switchback, but rather on the straight part of the road between the switchbacks—it’s easier to get moving again. You have up-close-and-personal views of the Red Mountains (there are three and you are in a pass between No. 1 and No. 2). And, once you get up topside, you have wonderful views to the east. The description of the GPS map continues after this photo taken at the top of Corkscrew Pass looking into San Juan County. Note that they require that any driver of any vehicle be licensed. This is targeted especially at ATVs. Atop Corkscrew Pass looking into San Juan County. You are at about 12,240 feet above sea level. Yes, those are thunderclouds and yes, I got a bit wet but not too bad. You cross the county line at the Pass and the road becomes San Juan County Road 11. This takes you steeply down to a rendezvous with San Juan CR 10. There’s lots of mud. I don’t like to use the brakes in mud, so I’d slow down as much as I could on the dry parts, and use first gear to hold me back through the mud. 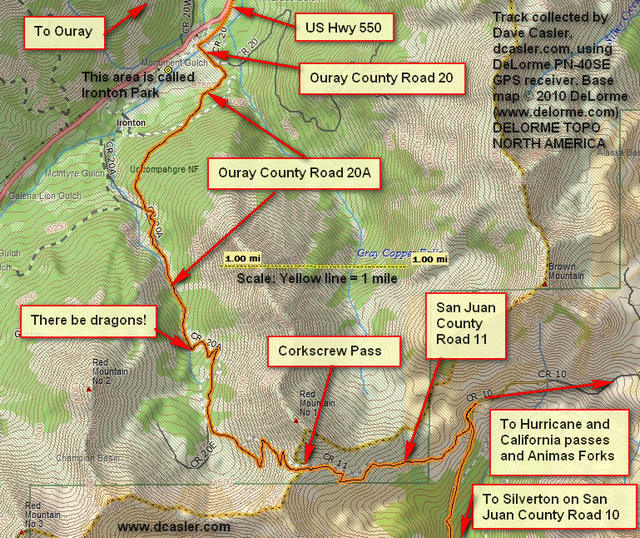 This entry was posted in GPS Tracks, Motorcycling, Ouray County, San Juan County and tagged Corkscrew Gulch, Corkscrew Pass, Ironton Park, Silverton. Bookmark the permalink. Hi, John. I’m now on my second set of tires. Kevin Anderson down at Planet Motorsports in Montrose put me into some mid-range tires he thought would be perfect for me. And, in fact, I like them better than the tires I had on the bike originally. My current rear tire is by Shinko, made in Korea, the E-700A 60335-1 4.60-18 63S Trail Master. I noted in looking the tire over closely this evening that it bears an admonition that I should not exceed 112 mph. I think I’m safe on that score! Looks like fun and looking forward to experiencing! I got the bash plate and other rock guards/smaller main jet ready to go on the DRz. I am going to run a .5 used front knobby and a rear like yours (Kenda 270 specifically). Thanks for the report(s).